How Can Gluten-Free Candy Bars Benefit You? You’ve probably seen the phrase “gluten free” on lots of food packaging and wondered what it means. To start off, gluten is a protein found in wheat, barley, rye, and other types of grains. Its primary function is to hold foods in their proper forms and shapes. Many types of breads, pastas, and cereals contain gluten. People with celiac disease should avoid eating gluten. This autoimmune condition causes damage in the small intestine if gluten is consumed. If someone with celiac disease continually eats foods containing gluten, this internal damage eventually prevents the body from absorbing nutrients from food. The solution for people with celiac disease is to avoid foods containing gluten and instead eat only gluten-free foods. You might think it would be difficult for people with celiac disease to find foods that don’t contain gluten, but there are many available gluten-free foods! For instance, did you know you can get a wide range of gluten-free candy bars? Certain varieties of Butterfingers, 3 Musketeers, Snickers, and Reese’s Peanut Butter Cups contain no gluten at all. Other companies make special gluten-free candy bars and prominently display that fact on their packaging. 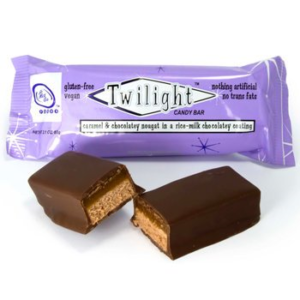 For example, the Twilight and Mahalo candy bars by Go Max Go are both gluten free and vegan. This Halloween, be sure to ask your trick-or-treaters if any of them needs some gluten-free candy bars. Then show them you’re prepared with some of your gluten-free candy stash! While it’s true that people with celiac disease must be careful of what they eat, there are still plenty of tasty gluten-free food options available to them. You can order your gluten-free candy bars from BlairCandy.com.